The Only Living Protein ! Made with 83% protein, Sun warrior has the Highest (non soy) raw (not heated over 90 degrees Fahrenheit) whole grain sprouted vegan protein on the market. We use old world process of combining the sprouted endosperm and the bran from Raw Sprouted Whole Grain Brown Rice. This unique process creates the first complete hypoallergenic Protein which is made up of all 9 essential amino acids and other non-essential amino acids in a perfectly balanced amino acid profile. 98% Correlation rate to Mothers Milk and a 98.2% digestion efficiency making it one of the highest digestibility and efficiency ratings of any other protein sources (compared to whey and soy). Created with a Low Temperature natural Enzyme process that does not use any chemicals or acid hydrolysis (like most proteins do). Naturally Rich in Vitamins and Minerals. Sun Warrior Protein contains high amounts of antioxidants Tocopherols, and Tocotrienols and other essential nutrients — such as thiamin, riboflavin, niacin, phosphorous, iron and potassium. Increases efficacy and absorption of vitamin, minerals. There has been a direct correlation between the use of Sun Warrior Protein and the absorption of vitamins. Because Sun Warrior Protein is so digestible, it can be easily assimilated by infants, the elderty and adults —The World Health Organization may be using Sun Warrior Protein in the future to feed malnourished individuals, because of the hypoallergenic profile, and superior absorption that Sun Warrior has shown to have. Weight Loss-Clinical studies in Japan have showed that by providing Rice Protein as a staple in a diet, that it can be used as a weight control vehicle. Especially, because of the superior absorption rates. Diabetes- There are Clinical Studies going on right now which show that because of the balanced nutritional profile of rice, it helps to actually maintain the diabetic affects of sugars, which could be used in diabetic products to help control insulin levels. Cholesterol-Clinical studies have shown promise that Sun Warrior has cholesterol lowering potential and the USDA is currently using Sun Warrior in trials to see if it. it may help control high blood pressure. Unlike the extraction processes of other proteins, our method of extraction uses neither chemicals nor acid hydrolysis, We only use Orcionic Enzymes during the process and our process is 100% Organic Compliant. 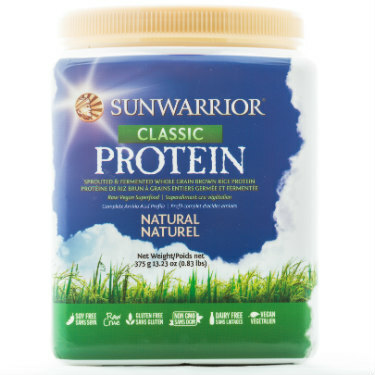 Introducing Sun Warrior Protein ! “Sunfood Nutrition™ has always worked to bring the most nutrient-dense raw foods and superfoods to our customers. When our goal is to have the Best Health Ever, we should strive to have everything we eat be the Best Food Ever. Whether it’s the easiest to digest or whether it assists with the absorption of nutrients from other foods, Sunfood Nutrition™ will always offer foods that contribute 100% to our customers’ health goals. That’s why I’m proud to bring you Sun Warrior Protein, a breakthrough advancement of a nutrient-dense, traditional food. Brown rice is used by billions of people the world over to build strength, maintain abundant energy levels, and achieve their higher life goals. Sun Warrior Protein focuses the nutrient profile of brown rice, turning a nutrient-dense food into a highly bio-available, almost pure protein superfood. Gain Muscle and Lose Weight with the best-tasting protein powder ever! Sun Warrior Protein is over 85% pure protein, totally Raw, and entirely Vegan. As budding Sun Warriors we now have the opportunity to fulfill our health goals and higher life purpose with strength and wisdom. Sun Warrior Protein has an extremely high digestion efficiency rating, allowing a wealth of nutritional benefits to saturate every cell in our bodies quickly and completely. The more super-powered nutrition our bodies can absorb, the easier it is for our inner grace and wisdom to manifest as vibrant beauty. Sun Warrior Protein is assimilated by the body so cleanly that it can actually help us absorb additional vitamins and minerals from the foods and superfoods in our diet. Current studies indicate significant benefits for reducing cholesterol and promoting a slow release of sugars into the bloodstream, both of which help to establish Sun Warrior Protein as one of the most potent anti-aging foods available today. Step into the Sun, and experience the deep-rooted power of a true Sun Warrior! Sun Warrior Protein begins as raw, whole-grain brown rice, germinated to maximize the levels of bio-activity. Natural plant enzymes are introduced which digest almost all of the carbohydrates, leaving only easy-to-digest protein. Carefully monitored bio-fermentation of the organically-grown brown rice progresses steadily until the protein concentration reaches 85%. This leaves only pure amino acids in a form which the body can easily recognize and absorb. The result: an incredible 16 grams of protein in each 1 ½ Tablespoon serving of Sun Warrior Protein! A side result of this process is an incredible, silky smooth texture and phenomenal taste, a marked improvement over soy protein, pea protein, Brazil nut protein, or whey. At no time in the creation of Sun Warrior Protein does the processing temperature ever exceed 90° F. This is a completely raw product, the first of its kind. The unique bio-fermentation technique used to create Sun Warrior Protein has astounding implications for nutrient availability. Most vegetable and rice proteins on the market use chemical processes which produce hard-to-digest, unbalanced protein. Sun Warrior Protein represents a huge advancement in taste and bio-availability, offering a massive increase in the amino acid Lysine and a tremendous boost in usable protein. This holistic bio-fermentation process leads to a concentrated protein source which is completely hypoallergenic and contains all 9 essential amino acids as well as many non-essential amino acids in a completely balanced amino acid profile. Sun Warrior Protein has been found to have a 98.2% digestion efficiency rating, ranking far above any comparable protein source. Sun Warrior Protein actually helps the body absorb many vitamins and minerals much more readily, making it perfect for infants, children, and the elderly. In the future, the World Health Organization may decide to use Sun Warrior Protein to feed malnourished individuals precisely because it is so easy to digest and due to the negligible risk of allergic reaction. At the present time, Sun Warrior Protein is being studied for its ability to improve the absorption of vitamins and minerals by individuals challenged by degenerative diseases. Superior nutrient content and enhanced bio-availability are hallmarks of all superfoods, a title which Sun Warrior Protein rightly deserves. Sun Warrior Protein is high in Tocopherols and Tocotrienols, powerful antioxidants known collectively as Super Vitamin E. This is due to the unique bio-fermentation processing method which preserves the bran of the whole grain brown rice with the sprouted endosperm. Whole grain brown rice is naturally high in many of the B Vitamins, including B1 (thiamin), B2 (riboflavin), and B3 (niacin). Both Vitamins B1 and B2 help the body create energy from the food we eat, while Vitamin B3 works synergistically with B1 and B2 to provide clean burning fuel for our cells. What happens when the best vitamins for energy production are preserved alongside one of the world’s most bio-available sources of protein? This is Sun Warrior Protein: the amino acids the body needs to enhance strength and rejuvenate the cells, combined with vitamins essential for transforming what we eat into vibrant, abundant energy. Sun Warrior Protein is high in the minerals Iron, Potassium, and Phosphorous. These three minerals work together in the body to oxygenate tissues, support muscular health, and maintain cellular energy supplies. Sun Warrior Protein helps shuttle essential amino acids to the cells as quickly as possible, along with the minerals the body needs to focus energy and apply it effectively. Current ongoing clinical studies have linked the balanced nutritional profile of rice to a slower release of sugars into the blood stream. This characteristic assumes even greater importance with Sun Warrior Protein, which preserves more of the nutrient value of organically-grown brown rice while assisting the digestive process. Sun Warrior Protein has the potential to benefit those challenged by diabetes and other blood sugar irregularities in a wide variety of superfood applications. Cholesterol is naturally produced by the body to protect cells during replication, but once it oxidizes it becomes toxic. Clinical studies have shown that Sun Warrior Protein may help lower these levels of cholesterol over time. The United States Department of Agriculture is also studying Sun Warrior Protein for ways in which it may benefit those challenged by high blood pressure. These aspects of Sun Warrior Protein are exactly aligned with the best features of all nutrient-dense superfoods: they help to remove any obstacles to achieving optimal health, all while making nutrient absorption more efficient and direct. The superior nutrient availability of Sun Warrior Protein makes it an excellent choice for anyone seeking to attain their optimal weight. Clinical studies carried out in Japan have shown that rice protein may be used to effectively control weight loss. Sun Warrior Protein preserves the nutrient density of whole grain brown rice and enhances the availability of its amino acids, vitamins, and minerals. When the body has absorbed all the nutrients it can handle, the brain receives a clear signal to stop eating; we feel full because we are full…. full of the best food ever. We are then free to use our energy to achieve our life goals and create joy and abundance. With Sun Warrior Protein, full nutrient absorption goes hand in hand with great taste, and our weight loss goals come one step closer to reality. All of these factors combine to make Sun Warrior Protein one of the most effective anti-aging foods ever created. Consider this: aging is largely a matter of slowly losing the ability to reclaim the full nutritional value of the foods we eat. What if we were able to absorb virtually all of the nutritional value found in certain foods, and what if these foods could help us absorb many of the vitamins and minerals in every other food? Sun Warrior Protein brings an answer into the light! Discover what is possible when great taste combines with full nutrient availability. Discover the benefits of a food that works to enhance our beauty, reverse the aging process, and build muscle mass, all while easing the absorption of nutrients from all other foods. Discover Sun Warrior Protein.